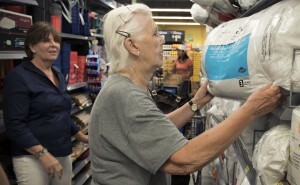 Social worker Julie Turner helps Wanda Witter (right) select pillows for her apartment. Photo courtesy of the The Washington Post. Wanda Witter, a retired machinist and divorced mother of four adult children, was homeless and lived on the streets of Washington, D.C. for 16 years. That is until she met Julie Turner, a social worker at Downtown Cluster of Congregations. Turner went through Witter’s meticulous paperwork and found she had evidence to prove she was owed money. Thanks to the work of Turner and others Social Security is sending Witter a $99,000 check. The agency may also owe Witter more in back payments..
Turner has now helped Witter find an efficiency apartment for $500 a month, which Witter can afford now that she is getting the lump sum payment and regular Social Security checks. Cheers to The Washington Post and reporter Petula Dworak for sharing this story. Take time to read the full article. Social workers help people from all walks of life overcome life’s challenges. Learn more at the National Association of Social Workers’ “Help Starts Here” consumer website. Social workers accomplish such things, every day and in every state. Maybe not to the individual tune of $99,000, but multiple times that in the aggregate. And no one notices it as we generally do it in confidential and anonymous practice.